Time magazine thinks Steven Spielberg’s Munich is important enough for a cover story, a glowing review, and an interview with Spielberg. Although the movie is a great conversation starter, it suffers from Spielberg’s penchant for mass entertainment. From there, Spielberg follows Avner (Eric Bana), a Jewish agent hired by Mossad (the Israeli CIA) to assassinate the assassins. He’s given a bottomless budget (“get receipts!”) and a team of four assistants and then asked to disappear into the European woodwork to do his business. The acting and ensemble performances are very good. Five agents, each with a unique talent, form Avner’s core team. We have the explosives expert, the hothead who prefers guns, and the two eldest members (one an expert forger) who look so “normal” you would never suspect them as assassins. Their superfriends adventures play like an action movie, if you want them to. One of the most riveting scenes belongs in the “political thriller” genre. Our team has planted a bomb, but the target is surrounded by innocent family members. We want the assassination to work, but we don’t want there to be any collateral damage. Spielberg and long-time editor Michael Kahn play the scene beautifully, pulling the audience to edge of its collective seat. Adding to the tone of the film is the work of cinematographer Janusz Kaminski. For sheer competence, there isn’t a better cinematographer working. Camera moves are precise, beginning and ending on perfectly framed shots, often with elaborate reflections and blocking in-between. Though the visual violence of the assassinations recalls Schindler’s List, the showy competence of the photography resembles War of the Worlds. If you’re able to think above the gut level, you may realize that it’s not the greatest feeling to be rooting for an assassin. Granted, he is acting on revenge, which is usually pretty satisfying in films, but his is a cold, institutionalized form of revenge, not sanctioned by any legal authority anywhere. At first, the thrill of the hunt is enough to get the audience past any moral doubts. But as Avner begins to lose his soul, our own doubts begin to surface. Spielberg smartly makes the assassinations “fun” for most of the movie. At first it keeps the audience’s attention, but when we start to question the value of revenge, we have our own complicit enjoyment to account for. By the end, we see that revenge has wrought havoc on Avner’s life. But we never get to gloat or say “I told you so” because we were right there with him all along. 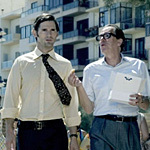 At the end, Avner’s Mossad contact (Geoffrey Rush, also excellent) adds to the theme, saying, in essence, that in spite of nationalistic feelings or personal relationships within the organization, government is business, not family. If we are to learn a lesson from Munich, it is to remember that our government as a business partner and not a parent. A cold distance is appropriate when dealing with them. Spielberg probably set this theme up even earlier, in a scene with Golda Meir, who seems a perfectly matronly figure, until it comes time to get down to business. Then her warmth and hospitality disappear. But for all the film’s success and competence, it’s still hard to grant it the importance Time Magazine gave it. Because in the end, Munich is a Steven Spielberg film. As such, it lacks subtlety. Though there are complexity and metaphors in Munich, Spielberg can’t simply let them become part of the weave. He has to spell them out with expository dialogue (written by Eric Roth, who penned The Insider and Ali for Michael Mann, and Tony Kushner). In an early scene, Golda Meir is in a meeting regarding Israel’s response to the murders, but it sounds like she’s giving a speech. She says “Sometimes civilization makes compromises with its own values,” which isn’t a bad line of dialogue, except that it sounds too perfectly written. If she were giving a public speech I might believe she said it, but in a meeting of advisors, it’s hard to imagine she just tossed it off. Another obvious scene comes at a safe house in Athens, where the Israeli assassins find they have to share a room with Palestinian terrorists (a little joke at their expense played by Louis and his father). Once the tension dies down, It’s a perfect excuse for some direct dialogue between an Israeli and a Palestinian. The dialogue and the situation are too perfect. We can’t simply get swept up in the movie without stopping to realize that we’re being spoon-fed a lesson or an insight by a manipulative craftsman. It’s easy to see Munich and have your own preconceived notions reinforced. If you are an anti-Spielberg snob, you’ll probably notice such moments of “too perfect” setups and showy craftsmanship. On the other hand, if you’re inclined to see a thoughtful, complex film about the cost of revenge, you’ll probably find a lot to talk about with friends after the show. Marty Mapes: A friend sent me an interesting article on the real story of Israel's response to Munich.